The services of Holy Week transform us into eyewitnesses and direct participants in the awesome events of the Passion and Resurrection of Jesus Christ. See our April Calendar for all Holy Week services and Confessions. See the pictures for all of the following services/events under Media/Photos/2019. Palm Sunday Vigil (April 20th), Palm Sunday and a Trip to the Holy Land presentation by Greg, Alex and Dan on April 21st. The Sacrament of Holy Unction, the Church's specific prayer for healing of the sick was served on Thursday, April 18th. Lenten Activity Night was held on Friday, April 19th, where Church School students gathered after Matins to make Blessing Bags for the homeless as well as a lesson on Pascha and Holy Week. Our Easter Bazaar was held on Saturday, April 13th. Thank you to everyone who made it a great success. You know who you are! Lenten Youth Sunday was held in our Parish on Sunday, April 7th. 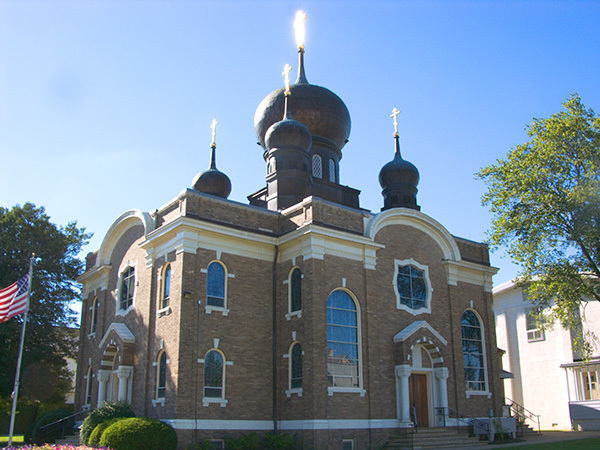 The Annual Pascha Agape Meal will be served after Midnight Pascha service. This is a once a year opportunity for the entire Parish to break the fast together in the glory of the Resurrection. The signup sheet for this Pot-Luck event is available on the Church's bulletin board. Please make a cooked food donation and join your brothers and sisters in breaking the fast. The Men's Club is sponsoring an Atlantic City trip on Monday, May 6th. The bus to Resorts leaves from the parking lot at 9:00AM, returning about 6:45PM.